Each game must be based around a common theme i.e. gravity, vegetation, swarms, etc. The games themselves were hit and miss (as expected) but there were a few gems. One guy, Kyle Gabler, turned his 4-day prototype Tower of Goo into indie darling World of Goo. Unfortunately, I can't find any of the old games online anymore, so you can't see them for yourselves. Hopefully they'll get put back up sometime soon. The experiment lead to the Gamasutra feature How to Prototype a Game in Under 7 Day (an interesting read on its own). ANYway, they guys recently got back together, revamped the ExperimentalGameplay.com site, and restarted the old competitions. One of the recent games is Bunny Blaster. It's difficult to say why this is such a fun game. 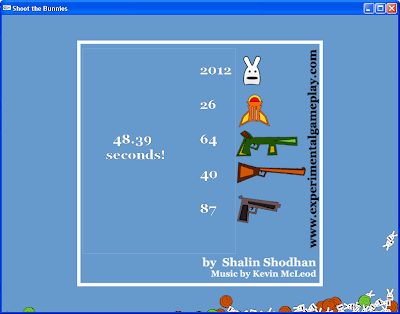 You shoot the bunnies to help them multiply (none of them die from being shot). The goal is to get to 1000 bunnies (at which point the game stops). It's crazy addictive. I even managed to break 2000 (bombs already set will still go off after the game ends), and in less than 50 seconds. UNBEATABLE! The creator, Shalin Shodhan, says he's working on an updated version to fix some annoyances with the prototype and add features (maybe an ENDLESS mode?). Of course, since the original took less than a week, the update may even be done before this posts (I'm writing this on the 14th). It totally works with Crossover.